A quick note here to explain how absurd Seth’s statement was. First of all, we – we being Seth, Shai, Pat, and me – had just left the tidal mudflats after finding and enjoying two Arctic Terns and there had been no Sandwich Tern present. Second of all, there were no birders on the flats, which means that Seth and Shai had spotted the bird from the restaurant, which, while it sits up high on the barrier island that is Cupsogue Beach County Park, is quite distant from the spot on the flats where the terns are. Absurdly distant. Theoretical birding distant. But a big tern that does not have an orange bill sticks out pretty well, and Seth and Shai were pretty darn sure of their sighting. Finally, and most absurdly, all four of us were back out on those mudflats making a beeline for that bird as fast as we could get out there! Wow! Sandwich Tern! Sandwich Terns are neither named for the tasty combination of two slices of bread and assorted fillings nor for the Sandwich Islands, now known as Hawaii. 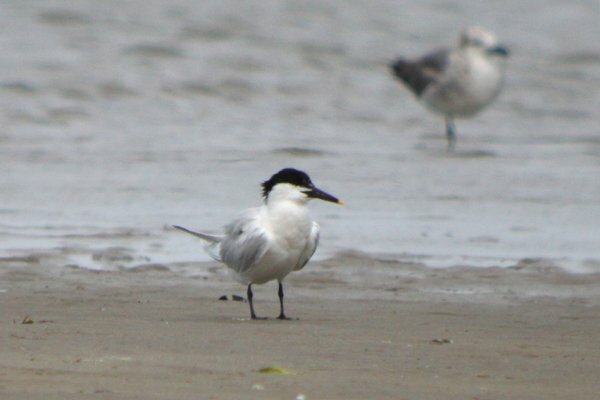 No, Sandwich Terns are rather boringly named after their type locality, Sandwich, Kent, United Kingdom. 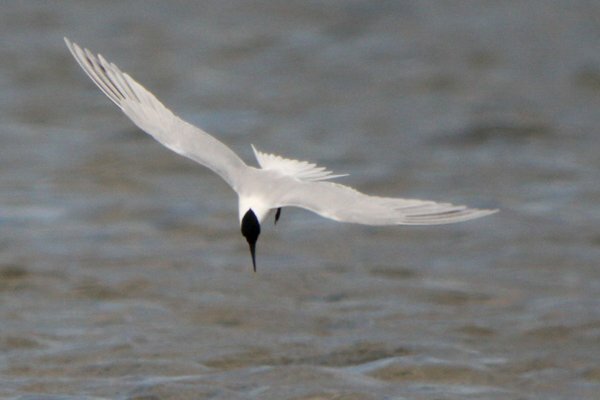 Despite the uninspiring root of their name, Sandwich Terns are pretty darn cool birds, with their yellow-tipped black bills and their shaggy hairdos. And our bird did more than just sit around – it decided to look for food while we watched! Once the tern managed to get a couple of bites to eat it then bathed before flying over to preen a bit. 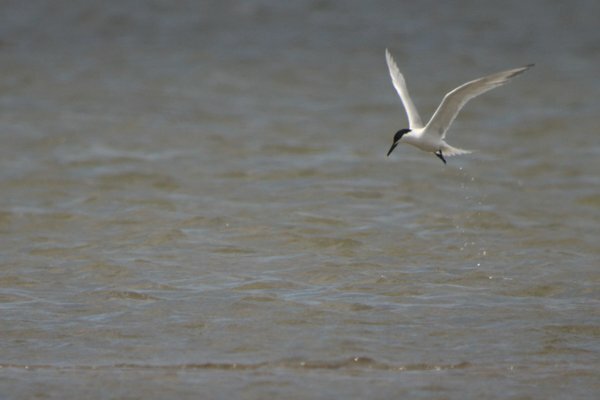 I like this shot, taken as the tern flew over to preen, because it looks like it is abandoning the Common Tern to drown. Sandwich Terns are apparently quite callous. 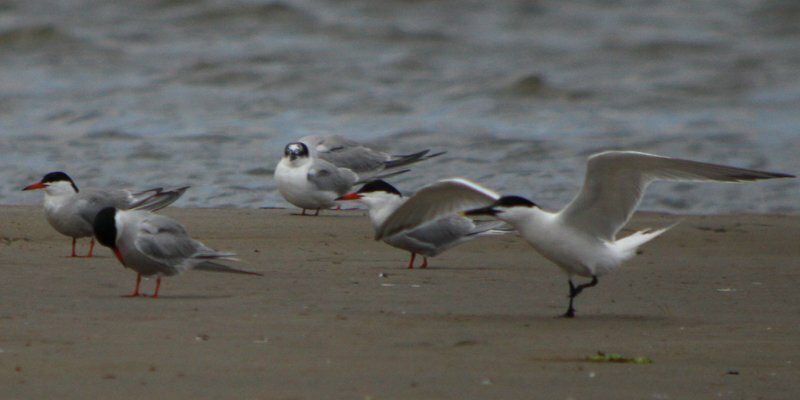 Once the Sandwich Tern went back to the sandbar to preen it didn’t take us birders long to realize that it had conveniently put down in proximity to one of the Arctic Terns from our earlier visit to the mudflats. Now that is one heck of a tern combination! 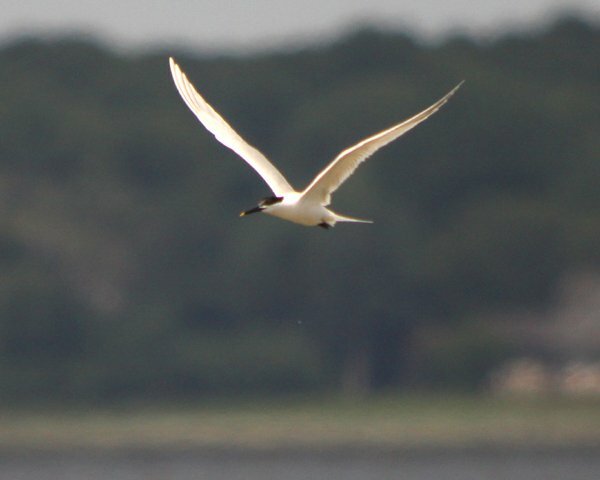 Here’s hoping I don’t have to go two years before my next Sandwich Tern, though, considering how rare they are in New York, I would be lucky if it is only two years until I see one again!